Successfully Added Quad Band Dual SIM Cellphone - Slim Touchscreen Mobile (Silver) to your Shopping Cart. 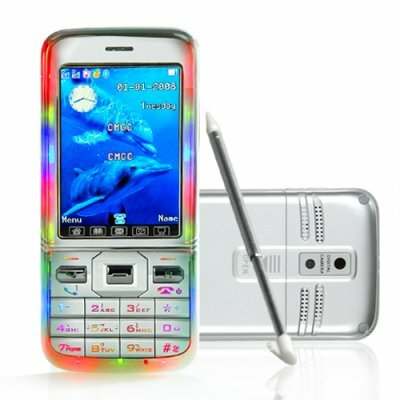 Quad Band Dual SIM Cellphone - Slim Touchscreen Mobile (Silver). Slim profile four band GSM unlocked dual SIM cellphone with 2.6 inch touchscreen for worldwide use. This modern unlocked digital mobilephone is a quad-band (850MHz, 900MHz, 1800MHz, 1900MHz) GSM/GPRS worldwide use phone with two SIM card slots (Dual SIM with dual standby) allowing you to have two active numbers within the same mobile. In addition, this model has plenty of easy to use PDA type productivity tools and multimedia features. The signature functions include; multi-color LED keypad alerts for incoming messages and calls, messaging with touch screen and handwriting functions, modern phonebook + contact manager, easy to use keypad, and Bluetooth with A2DP + AVRCP. This model mobile phone is in stock now and available for single sample or bulk orders. Order your stock now and don't forget to check our mobile phone accessories section to see our selection of Bluetooth speakers and earpieces. HOT FEATURE - Multi-color LED keypad and vibration options for incoming messages, calls, and music playback! MicroSD/TransFlash memory card slot with 512MB card included. Allows expansion and swapping of cards. Resellers: Another good descriptions to put in your listings could be "Unlocked Two SIM cell phone with color LED lights"
What languages does the quad band dual SIM cellphone come in, I do not see mine ________ listed? The phone comes with a default selection of languages which are - English, Spanish, Portuguese, German, Malaysian, Indonesian, Vietnamese, Russian and Thai. If you need other languages and plan to order a large quantity (25+ pieces) then we may be able to supply it with the particular language you need. I cannot seem to restore the settings on my quad band dual SIM cellphone, why? The password of restore factory setup is "0000". The information in the user manual states "1122", this has been updated to "0000". on 2009-06-19 13:47:37 Excellent buy! Top value for your money, all my customers love them! THANKYOU!